Planning a prom takes a lot of forethought and hard work, but it's certainly worth it to make that magical night happen. If your prom committee is wondering where to begin, we have plenty of advice for you. Know how much you have to spend and do some research to find out how much the most important elements of your prom are going to cost. Then you can begin to portion out the funds for things like your hall rental, music and refreshments. If you're lucky, your school keeps a file filled with info and business contracts from previous plans. You can use this info as the blueprint for your prom, and just change the details as needed. After your budget review, the first thing you're going to need to decide is where your prom will be held. Many schools use their own gym. On the plus side, it's a real money saver. On the minus side, it's a gym. It's not likely to be attractive no matter how much money you spend on decorations. You can make the space work if you have to, but if your budget is big enough, you might want to consider renting a hall.If you do decide on a hall, you'll have to see which dates they have open and plan the date for your prom accordingly. Your choices may be limited because many halls will be booked with weddings and so forth. As far as cost, your local legion hall or VFW post will be less expensive to rent than a hall at one of the finer hotels. Tickets should be your next item to tackle. If your high school happens to have a print shop, getting your tickets printed should be easy and fairly inexpensive. If you have to go to an outside printer, you'll pay a little more. You need to come equipped with all the pertinent info you need included on your tickets, such as the date, time and location. A professional printer will work with you to get the wording just right and make sure you've included the essentials, so don't be afraid to ask for help. If you get a sample ticket for approval make sure there are no mistakes on it, because once the batch is printed you're stuck with them.Keep your ticket prices affordable, but high enough to help pay for some of the expenses. 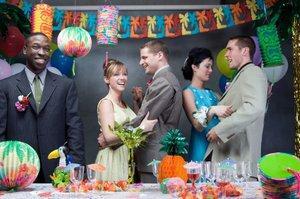 Your choices for decorations will depend a lot on the location of your prom. A nice hall will probably require less decorating, and some venues provide many of the decorations with the rental. This typically includes table linens and centerpieces. Legion halls will be a bit more spartan and require more effort from your decorations committee. Streamers, balloons and even candies sprinkled over the tables can all make the atmosphere seem more festive. Whatever type of decorations you'd like to have, you'll have to consider the building's fire code regulations. Most halls will not allow you to mount anything on the walls, and will list the dos and don'ts in the contract you'll sign. If in doubt, ask exactly what is allowed. Of course, you can't have a prom without music. Your main options are a live band or a DJ. If you choose a live band, you'll probably pay more, but it is fun to have one. You might even have a few decent bands amongst your classmates, so explore this option and give them a listen. You just might get some good entertainment at a reasonable price. If you decide to go with professionals, you can locate bands in your local phone directory. Make sure any band you choose is able to play the type of music you request. Whether you want the DJ to take on additional M.C. duties such as announcing the prom king and queen, prom court, etc. Plan on booking your music six months in advance of your prom date, or you may wind up listening to a boom box. What's a prom without pictures to remember it by? Your yearbook committee will likely want to take candid shots to include in the yearbook, but you'll need a professional photographer for the couple's portraits. Be sure to designate a corner of your hall space for the photographer's set up. Sadly, security is not an option these days, so you'll have to plan on providing it and figure this cost into your budget. It's fine to ask parents to chaperone the event, but you'll also need to hire some private security guards or off duty police officers to keep the event safe for everyone. You may even find that there are police officers amongst the school parents who might be willing to volunteer their services for the evening.